Heavy-duty work environments require suitable materials to get the job done right. 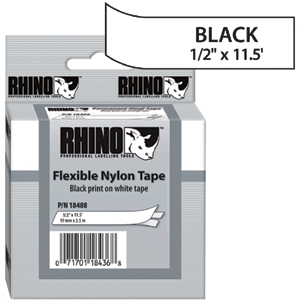 Fortunately, Rhino has the properties necessary to hold up under a variety of harsh circumstances. Multi-purpose label tape is equipped with industrial-strength adhesive, ensuring that labels remain fixed. The flexible nylon option is well-suited to marking cables and wires, and the polyester-coating option helps ensure type won�t smear or fade. A 3:1 shrink ratio guarantees a perfect fit. Split backing and easy-to-peel design makes application easy.